Entertain your baby with Penny the Pig, the Organic Farm Buddies Teething Rattle from Apple Park. The soft-stuffed teething rattle is made with 100% organic cotton fabric, and features an adorable character's head, with a rattle inside. The stuffed handle is easy for babies to grasp and squeeze, and it's fun to chew on, too. 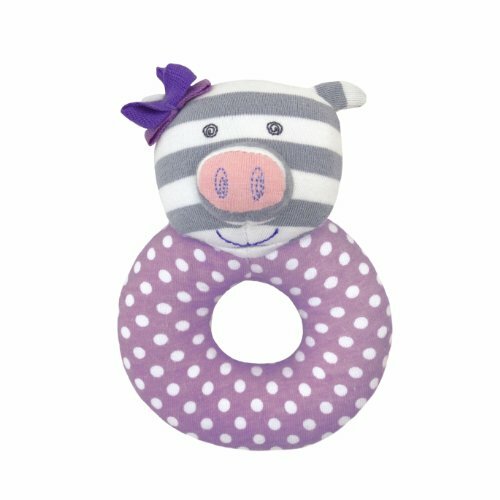 Organic Farm Buddies Teething Rattles are safe for babies, made with 100% certified organic cotton fabric with hypoallergenic sustainable corn fiber filling and dyes. Organic Farm Buddies products are naturally hypoallergenic, made with certified organic materials that are non-toxic, polyester free, PVC free, non-phthalate, contain no pesticides and no chemicals. Winner of the Best Vacation Product Award, Best Green Toy Award and Best Bay Area Toy Company Award from Dr. Toy. A bit about Apple Park, maker of Organic Farm Buddies: Our founder Angie Ting set out to create a line of toys with her two young children in mind. Angie formed a partnership with Pate International, a highly respected San Francisco design firm known for their environmentally conscious designs. Together, Susan Pate and her daughter Chloe Pate helped Angie realize her dream of creating socially and environmentally responsible toys. Safe for children, better for the environment, and always beautifully green. that's the Apple Park Promise.